Chickpeas are quickly becoming a staple in our home, and this quick salad is one of our favorite ways to prepare them. It’s smoky, crunchy, creamy, and wonderful! Use it as a topping for a green salad and you won’t need salad dressing, or use it as a filling for sandwiches or lettuce wraps! Delicious! Place drained chickpeas in a medium mixing bowl. Mash about half of them using a fork or potato masher. Add the rest of the ingredients and mix well. 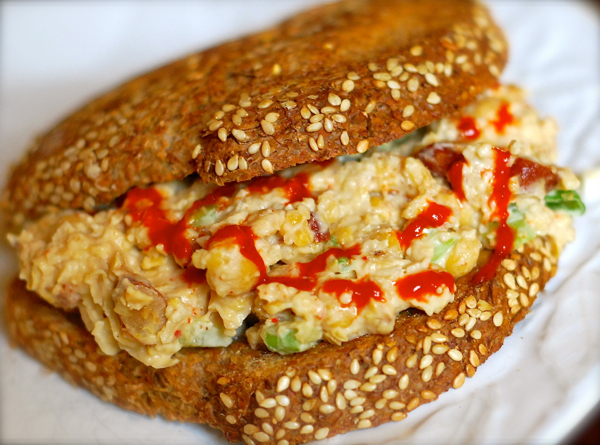 Pile high on your favorite sandwich bread, and top with a little hot sauce, if you wish.